Thyroid cancer is one of the fastest growing cancer diagnoses in the U.S., with nearly 63,000 new cases expected to be diagnosed this year. Recently, researchers have been exploring whether this rapid growth in the number of new cases is the result of increased screening and over diagnosis. If you’ve received a thyroid cancer diagnosis, what should your next step be? Why are the number of cases increasing? In the last two decades, the incidence of thyroid cancer has more than doubled in this country according to statistics gathered by the National Cancer Institute. In South Korea, where preventive screening for the disease is inexpensive and common, thyroid cancer is now the most common cancer in the country. 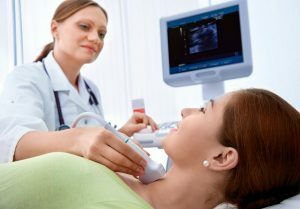 The question that researchers have raised is whether there really is an increase in the incidence of thyroid cancer in the U.S. and other countries, or are more cases that may not require treatment being detected through regular screening of patients without symptoms and the use of ultrasound and CT, which can find very small tumors that may never progress or spread. A paper published in the New England Journal of Medicine that explored this rapid growth in the diagnosis of thyroid cancer in South Korea found that the number of diagnoses grew very rapidly once screening for the disease became popular and almost all of the tumors detected were very small and were of the least aggressive form of the disease. Another consideration is the fact that the treatment for thyroid cancer is the surgical removal of all or half of the thyroid gland, followed by treatment with radioactive iodine. Like all surgeries, thyroidectomy poses risks, including accidental damage to the vocal chords and the parathyroid glands that control calcium levels in the body. After surgery, patients must take thyroid hormones for the rest of their lives. What steps should you take if you’re diagnosed with thyroid cancer? Before undergoing surgery, it’s extremely important that you get a second opinion from a pathologist who is experienced with the disease. One of our clients recently underwent a fine needle biopsy of a nodule in her neck that the pathologist categorized as suspicious for malignancy, a finding that is not definitive for the presence of cancer. Her endocrinologist recommended the removal of the thyroid. We arranged for the tissue from the biopsy to be examined by an experienced pathologist at the Johns Hopkins Hospital. The Hopkins pathology team’s diagnosis was that the nodule was benign. The second opinion gave the patient the option of avoiding unnecessary surgery and its associated risks. This also saved the client from the anxiety of a cancer diagnosis and long-term surveillance as well as a lifetime of thyroid hormone replacement medication. If a second opinion does confirm a diagnosis of thyroid cancer, it’s important to find out what form of the disease is present. There are four primary types of thyroid cancer. The most common, which accounts for 80 percent of cases, is papillary carcinoma, which is frequently a very slow-growing cancer. Talk with your physician about what treatment options are available for the specific form of thyroid cancer you have. If you want additional information about treatments and other options, including relevant clinical trials, a health advisor can provide evidence-based information on the disease and all available treatments so that you can make an informed decision.